Escape the urban bustle at Red Beach and Caldera Beach. Give yourself a bit of retail therapy at Aquamarine Jewelry and Art Space. Explore Oia's surroundings by going to Perissa Black Sand Beach (in Perissa), Akrotiri (Santo Horse Riding & Akrotiri) and Kamari (KAMARA BEACH, The Secret Room, & more). And it doesn't end there: take in the exciting artwork at MATI Art Gallery, hike along Hiking Trail Fira - Oia, shop like a local with Oria Gallery, and enjoy the sand and surf at Vlychada Beach. To find traveler tips, more things to do, where to stay, and more tourist information, refer to the Oia trip maker site . Montreal, Canada to Oia is an approximately 15-hour flight. You can also do a combination of flight and ferry; or do a combination of flight, car, and ferry. The time zone changes from Eastern Standard Time (EST) to Eastern European Time (EET), which is usually a 7 hour difference. Traveling from Montreal in May, things will get a bit warmer in Oia: highs are around 28°C and lows about 20°C. Wrap up your sightseeing on the 15th (Wed) early enough to travel to Ios. Halfway between Naxos and Santorini lies tiny Ios, famous worldwide as one of the Aegean's liveliest nightlife hubs. Kick off your visit on the 16th (Thu): tour the pleasant surroundings at Manganari Beach and then kick back and relax at Kolitsani Beach. To see maps, ratings, traveler tips, and more tourist information, refer to the Ios vacation site . Traveling by combination of taxi and ferry from Oia to Ios takes an hour. In May, daily temperatures in Ios can reach 27°C, while at night they dip to 19°C. Finish your sightseeing early on the 16th (Thu) so you can ride a ferry to Paros. Long ignored by tourists because of its reputation as a plain ferry hub, Paros today serves as one of the Aegean's major holiday destinations, luring travelers with its fashionable resort towns and quaint mountain villages. On the 17th (Fri), step off the mainland to explore Parikia Town, take in the exciting artwork at Yria Ceramic Studio, then contemplate in the serene atmosphere at Panayia Ekatondapiliani Cathedral, then look for gifts at ONEIPA Concept Store, and finally kick back and relax at Piso Aliki Beach. Keep things going the next day: steep yourself in history at Lefkes and then enjoy the sand and surf at Voutakos Beach. 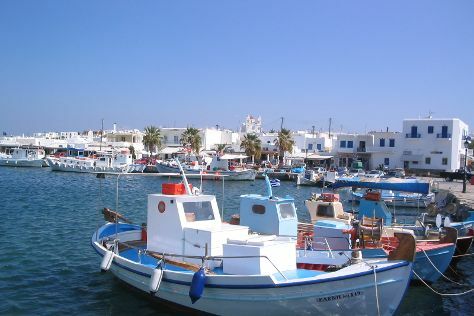 To see ratings, where to stay, and other tourist information, read Paros trip maker . Traveling by ferry from Ios to Paros takes 1.5 hours. In May in Paros, expect temperatures between 27°C during the day and 19°C at night. 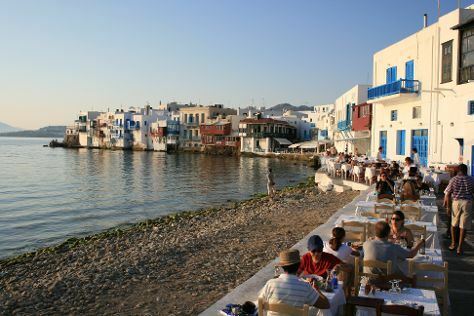 Wrap up your sightseeing on the 18th (Sat) early enough to ride a ferry to Mykonos Town. You'll enjoy a bit of beach vacationing at Panormos Beach and Platis Gialos Beach. Head to Savvas Traditional Greek Products and Dio Horiafor plenty of shopping. The adventure continues: take a stroll through Little Venice, explore the world behind art at Minima Gallery, view the masterpieces at The Big White Gallery, and stroll through Agios Stefanos Beach. To see photos, other places to visit, maps, and more tourist information, you can read our Mykonos Town trip itinerary planning site . Traveling by ferry from Paros to Mykonos Town takes 1.5 hours. Expect a daytime high around 26°C in May, and nighttime lows around 20°C. Finish your sightseeing early on the 22nd (Wed) so you can travel to Faliraki. Famed for its sandy beaches, Faliraki serves as a major destination on the island of Rhodes. Get in touch with nature at Faliraki Beach and Valley of the Butterflies. 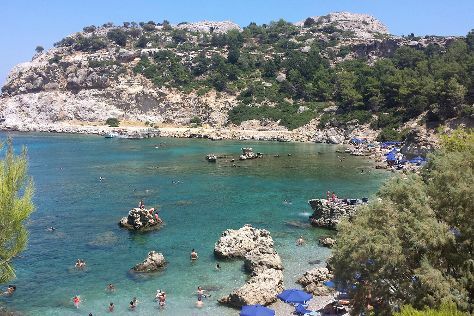 Your itinerary includes some good beach time at Lindos Beach and Tsambika Beach. You'll find plenty of places to visit near Faliraki: Lindos (Acropolis of Lindos & Village of Lindos) and Agathi Beach (in Haraki). There's more to do: don't miss a visit to Kallithea Springs and view the masterpieces at Artistic Village Contemporary Art - Art gallery & Museum of Ceramic Art. To see where to stay, reviews, traveler tips, and more tourist information, refer to the Faliraki day trip planner . Getting from Mykonos Town to Faliraki by combination of flight and bus takes about 4 hours. Other options: ride a ferry; or ride a ferry. In May in Faliraki, expect temperatures between 27°C during the day and 20°C at night. Wrap up your sightseeing on the 26th (Sun) early enough to travel to Athens. Do your shopping at Ermou Street and The Loom. The adventure continues: wander the streets of Plaka, take in the exciting artwork at Pandora Art Gallery, take an in-depth tour of Acropolis Museum, and get a taste of the local shopping with Technohoros Art Gallery. To see where to stay, ratings, more things to do, and other tourist information, read Athens trip itinerary maker app . You can do a combination of bus and flight from Faliraki to Athens in 4.5 hours. Alternatively, you can ride a ferry. In May in Athens, expect temperatures between 29°C during the day and 20°C at night. Finish up your sightseeing early on the 31st (Fri) so you can travel back home.